What if? Is a game I like to play, when I can find a free-thinking person. The rules? Take an outlandish notion and say “What if…?” relating to part of that crazy concept, as if it were actually possible. Then just keep it going farther down those whimsical trails. What if when the world was created, God had been a small child blowing bubbles, and the bubbles became planets. The people of earth could traverse their planet by riding on bubbles. What sort of what if can you add to that? Come on – I know you’ve thought of something. Leave a comment and let me know. Posted on September 21, 2013 by Teagan R. Geneviene •	This entry was posted in Motivational, Teagan's Books, Uncategorized and tagged Bubble, National Novel Writing Month, What If?. Bookmark the permalink. Hahahaha! That’s fabulous, Tess. Mega hugs! Oh no! My life is nothing more than the result of an accidentally overblown bubble… Pop! Oh nooo! Don’t pop, Kev! My bubble world drifts high above the roads, above the houses… Hopefully it will clear the top of any spiky pointy skyscrapers! Bubble hugs! That’s very cool, Olga! To me there is a certain whimsy in blowing bubbles that is nearly magical. Thanks for sharing this. Huge hugs. What if the people had traversed their planets on Bubbles and they arrived to a Blue Panet called Earth… They found that as it was overpopulated by human beings they’d rather add some new creatures. The Bubble Beings who had the ability to speak in bubble terms saying Bloop, instead of Hi… and so on… What if these two living species have reproduced between them… Which would be the result result of such a crossing? Okay then… So this cross-species of Earthlings and Bubblings… might have rounded bodies, but they would be very bouncy (the Bubblings having become much like the bubbles on which they rode, from constant contact). At first thought, the cross-species might seem quite fragile and pop easily, like the Bubblings. However, that is actually an asset as the popped Bubbling is simply caught in a dish and waits for someone to use the bubble-blowing wand to re-form them. The human-Bubbling combination is able to re-form itself, without the outside intervention of someone blowing through a bubble wand. LOL. A world where everyone has their own bubble (as if we don’t already)… so how does one get together with another? Where do babies come from? If we have different shapes or colors/shades, do they change if we join with another? Do they change over the course of a lifetime? What would dissolve bubbles and threaten our very existence? Can bubbles be regenerated? Ha!!!! Yes indeed, there are plenty of people in our real world in their own bubbles! I went through gallons of the bubble solution with my children and pets. The cats would chase and try to catch the bubbles, the dogs would snap if the bubbles came near. Bubbles are safe, clean, cheap and make everyone happy. But bubbles pop, and the reality is we float along in a bubble sometimes, then pop! back to real life. 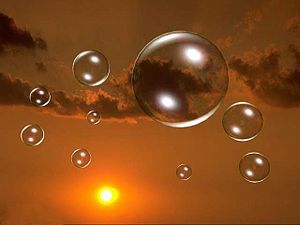 God’s bubbles wouldn’t pop – they would grow and nuture the life inside. Maybe, we are existing on one of his bubbles. Did you know they make a bubble solution with catnip? I once had some for my kitties. That could be fun. Maybe I’d be better at making catnip bubbles than I am at cooking. At least it doesn’t sound like anything I could over cook! I have some catnip spray… so maybe there was something like that in the nip bubble solution. Maybe like some sort of infusion. Tee-hee! What a riot. Worshipful or not, I’d hate to think all those tiny beings were in my bath tub. Poor things — they’d be terrified at the sight! Oh heavens! Then I’d have to pay for thousands of them to get psychoanalysis! I’d feel very guilty about using traditional soap in a bubble bath if the bubbles housed life forms. Soap pops bubble baths! It would be genocide! I think it says a lot about me that I pictured myself as the creator of galaxies. I’m not sure what a psychoanalyst would make of me! I’d think someone would suggest houses made of bubbles so that mother nature could grab her land back to repair it. People could choose to moor at different places overnight to view different sunrises. Your bubble home can drift or be propelled by thought to a specific point to maybe collect the worker at the end of their day. David, that’s fabulous! I love the idea of applying the bubble concept to housing — and to mother nature’s repairs. With that in mind, the transportation bubbles would be self powered. They would make little “gas bubbles” of exhaust! Farting fuel as they went! Haha! Hummm… so there would need to be a vacuum to catch them so they could be used for other things like providing power to the housing bubbles. Aaah…! So different bubble shapes might have different personality traits. Or we might be actually shaped like the bubbles. Oh wait… my bubble was definitely round! That was a marvelous “what if” Kiwiskan, and your blog is lovely. Thank you Teagan. Do you think there can be square bubbles? Tee-hee. Square bubbles – why not! I was actually thinking about your concept [of the people being defined by the shape of their bubble] while making my coffee this morning. I’m really going to have my hands full if I decide to try and summarize everywhere the Bubble What-If has gone! Maddie was bouncing on her iridescent pink bubble a tad too heartily when she bounced against a rent in the sky, bounding all the way through and into a summer day. It was a London park in 1890, full of butterflies and bees. She came to a gentle landing by the tea table at a cricket match, and looked longingly at the clotted cream, scones and berries. “Wouldzzz you likezzz some?” buzzed a bee. Then he and several of his friends zoomed away, but quickly returned bearing berries and clotted cream. The scones were so light and perfect that butterflies floated along with them. Thanks for the encouragement, Ashley! I’ve been enjoying your Blue Ridge Vintage blog. Sometimes it helps put me in the mood to write the Three Things Serial, as it turned out to be a 1920’s story. I’m so glad you like it! And so glad that it’s providing a little inspiration! I’m really enjoying your creative output on here, and is inspiring me to definitely give NaNoWriMo more of an effort this year! What if in honor of Peace Day (21st September) we all blew bubbles for peace today while walking down the street. Wouldn’t that be great! Thousands of people walking and blowing bubbles. Bubbles are so calming to watch (especially the large ones), how could anyone do anything that was not peaceful? I agree, sometimes I do go out and blow bubbles, it’s interesting to see how people react like here: http://bastetandsekhmet.wordpress.com/2013/07/28/photography-bubbles/ 🙂 I think we should make a movement and organzie for next year! What a lovely post! I’m glad you sent the link, and I hope everyone will check it out. The bubbles theme again? That’s funny given what I saw this morning while driving to buy cakes :-). Ha! Well, maybe the man you saw outside blowing bubbles in his yard has the substitute for Hungarian cakes. Or better yet, maybe I was meant to be prompted to write a blog mentioning bubbles yesterday, so that I could be found by another creative person on WordPress :-). Did any of your bubbles manage to soak and put out any of your work colleagues’ cigarettes? I bet that would have annoyed them. And then you could have said it was a new quit smoking technique – and that they too could start blowing bubbles as well to have something to do with their hand and mouth to replace the smoking! He he he. (Yes… obviously it’s a lot harder for someone to give up smoking than merely doing a simple switch, but the behavioural things, ie. being used to doing something with their hand and mouth out of habit is part of it too… after all it’s why some people prefer nicotine replacement therapy in a puffer than as patches). Szilvia you are so kind – thank you. Re the smoker friends from back when, just seeing me with the bubble-blower was enough to get that point across. Many of them already knew my father had died from emphysema (before they ever knew me). I didn’t need to say more. At first some looked at it with a bit of resentment, in expectation of judgment, but after a few “breaks” they accepted it. I love your “Joy Jar” concept. How wonderful! [It reminds me of a gift idea that was on my “Word Origin” calendar, about making a jar and filling it with scraps of paper, each listing something you like about the recipient.] I think by decorating it yourself (as you describe) you attach your intention to it as well. I hope everyone will check out your blog.